I paused because I remember how hard this was to achieve when I was a classroom teacher. Students with IEPs or students who needed extra help often left my classroom after the minilesson. They’d leave the room and come back with a lot more writing than when they left. That’s great, right? However, the next day, when the service provider didn’t pick them up, I would often find the same child stuck. They wouldn’t know what to do or would be looking to me (or a peer) to give them help. Through conferring with the student and through private chats with a few service providers, I came to realize that a couple of providers were often doing the writing for my students (i.e., coaching them heavily about what to put on the page or even telling them what to write). While the service providers who did this had the best intentions, it wasn’t helping the student(s) they worked with independent writers. When I realized what was happening, I asked some of the service providers to provide push-in for support. By pushing-in during writing workshop, they’d sit through the minilesson and then could work with the student in the classroom, often alongside his/her writing partner. This also allowed me to confer with my students while they were in the room. Further, when service providers were in the classroom, they were able to make notes in my conferring notebook about teaching point they delivered when they conferred with each student. This allowed for me to have better follow-up with my own students. This slide also got me thinking about goal-setting and strategic conferring, which Carl Anderson talks about. (Click here or here to read past posts on this topic.) If teachers work together with service providers to set two – three writing goals for a student, then I think it becomes easier for service providers to confer with students even when they leave the classroom. By setting writing goals with the service provider, it allows the teachers involved in the child’s writing life to be on the same page when it comes to what they’re working on with him/her. It also supports the notion that one is “teaching the writer, not the writing” every day. 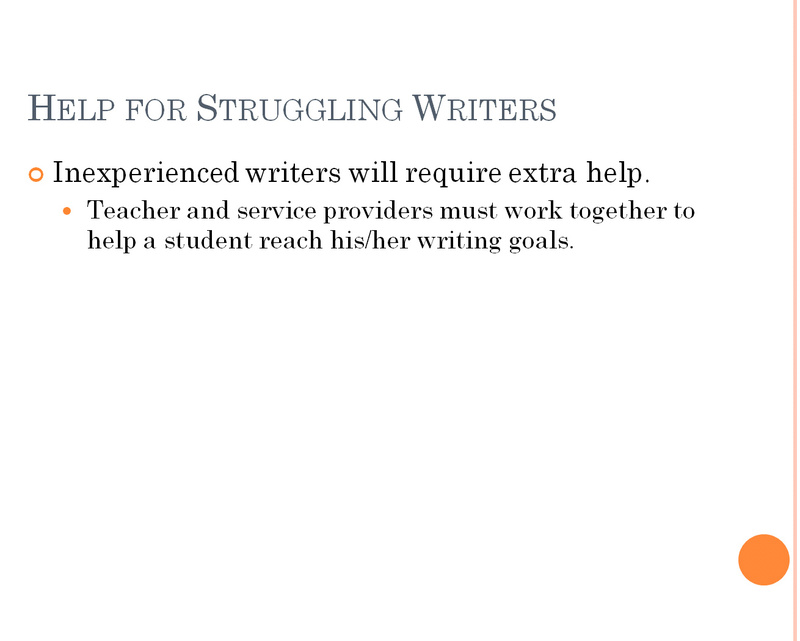 How do you effectively partner with service providers to help your students grow as writers? Please share what’s been working for you. I, too, am considered a ‘service provider.’ But personally, I like to consider myself a teacher. Unfortunately, many of my Special Education colleagues were so specialized in their programs, that they did not get the added benefit of becoming a Gen. Ed. teacher first. I am dual-licensed Gen Ed/SPED and it has helped me tremendously because I get to teach my students and not just help them. Working in a middle school (inclusion model) alongside my Gen. Ed. colleagues, was probably the most growth-inducing time of my career. What fun to learn from each other, co-teach/co-plan, and teach kids too! I’ve facilitated Writing Workshop in my resource room (3rd-4th grade) and actually talked with my students writer-to-writer. So now that I am back in the Middle School, I have big plans to get started with reading-writing workshop again. I like to parallel my Gen. Ed. English teachers as much as I can since my students get to work with them and come to me for some extra instruction. Collaboration with colleagues is so valuable and beneficial to our students. Gen. Ed. teachers, go watch your SPED teachers teach and SPED teachers, visit your Gen. Ed. colleagues in their classrooms to see how they do business. Getting started is really hard. I remember. The other side: About 6 years ago, teachers school-wide committed to writing workshop. The difference I see in my 5th graders’ writing is phenomenal. The struggling students feel comfortable putting thoughts down on paper too. The new students come in have a hard time getting started, but they soon see other students model the practice. We have pull out support for one of my writers. I feel there is a huge disconnect between his resource room goals and his classroom goals. I’m starting a new unit next week and I’m going to see if his resource room teacher would be willing to push in during this unit to support the student. I’m also going to follow your lead and make my conferring notebook available and work with her in setting new writing goals. Thanks so much for reminding me of how difficult it can be for these students to navigate between teachers and different teaching expectations. I have push in support and have given scripts to my resource teacher and teacher aide that help guide the teaching. Often times there is almost no time for a conversation and I was constantly seeing support staff “over” supporting. There is this assumption that kindergarten kids “can’t” write and need everything spelled out or told to them. So far from the truth. Writing just happens to look a little different in the beginning stages. I saw instant changes in independence when consistent facilitation was dosed out instead of hand holding. The staff want to help but often need our support and direction to get there. We are with the students and often have a better relationship and understanding of their true potential. A potential that needs to be given a chance if ever to bloom! We are not doing push-in this year. The AIS support works closely w the classrom teacher. We meet w her once a week.We tell her what we are working on in the classrm, she supports that in AIS. She tells me if she sees any problems so I know if I need to give additional support in the classrm. Students move in and out depending on how well they do. These continual mtgs. help. If I see a weakness she will gladly work on that w students. Students have AIS during a study hall type period. @Vicky: I’m glad the AIS teacher is working well with you. That’s a blessing! I guess I am a ‘service provider’ or an ‘interventionist’ in the last couple of years of teaching. I am also a coach in my heart of hearts and know for a fact that students…especially struggling students, need to be there for almost everything we do in the classroom. I am choosing this year and hopefully next to team-teach during the writing block in a fourth grade classroom and it continually brings me joy at being able to “teach all writers, not the writing”. Many of my teacher friends are very happy with me taking students ‘away’ during their reading blocks because of the huge class sizes (34) in lower primary…this concerns me. It takes a special person to allow another tall body in! @Nancy: I like what you said about it taking a special person to allow another “tall body” into their classroom. It does! I know that’s really hard for some people to do. In fact, when I started asking service providers to push into my classroom, I was really nervous. I was worried they’d judge me, interrupt the lesson, or critique me in front of my students. All of those fears subsided when I saw only positive things occur after having them in my classroom for an entire period. Too often we let our fears get the best of us. In reality, our goals are the same. There’s nothing scary about it since the big thing that both people want to do is to help kids succeed.